Top news story of the day: The Banner Saga is a really good game that is also beautiful. Give it a look if you’re into games about positioning little people on a board and making them hit other little people. Other important things: The Nerd Nite for this month unfortunately had to be canceled. We can’t get into the nitty-gritty of it but suffice to say there were a lot of extremely well-choreographed martial arts sequences as well as a mysterious individual carrying a briefcase that we couldn’t allow into enemy hands. Now that we’ve recovered the case, we can focus on next month! The presenters are going to be spectacular, so you should start getting excited right now to ramp up for the reveal! JiffyCon! JiffyCon is a thing that’s happening and we’re excited about it. It’ll be next month, and it’s going to involve a lot of gaming and designing and game testing! It’s a small convention held at Hampshire College, and it’s mostly an excuse to experience a whole lot of new things at once. It’ll be $10 for pre-registration, $15 at the door. 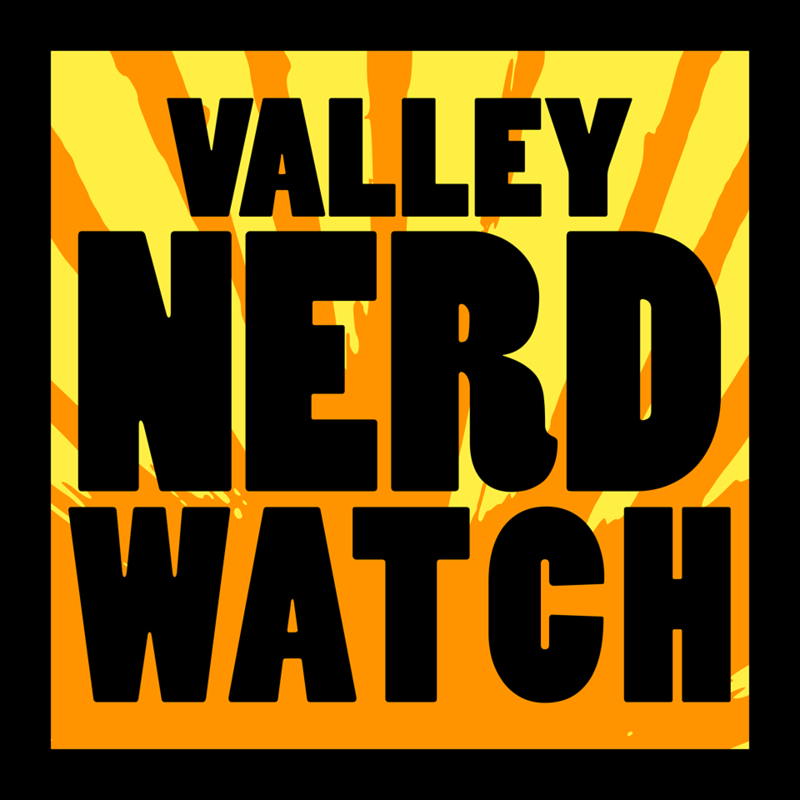 They’re also kindly sponsoring the Nerd Watch! This is extremely flattering to us. But we promise to not allow this to compromise our dedication to the most serious and accurate reporting to you the date, location, and time of the event. No matter how much money they give us we will never insist that JiffyCon takes place in an ice cream palace full at exactly the moment that you most feel like playing games! Also do continue to check out the Noirlandia kickstarter! They’re adding new authors and extra stuff constantly, and the game just looks really neat to boot. Make Big Things? More like Make Good Things? Eh? Star wars and tiny little habitats of fake plant and animal life, the match-up for which we were all waiting is finally here! Put together a tiny little world where a bunch tiny stars have tiny wars with each other! Star Wars and potted gardening, the match-up for which we all were waiting is finally here! Take a planter, paint it up like a stormtrooper or a droid or whatever strikes your fancy, then take it home! A panel of several writers will discuss writing about disability. Featuring Claire BLantchford, Katherine Duke, and Susan Stinson. This is the perfect opportunity to educate yourself or share your own experience with some experienced writers! Artist Tom Friedman will be featured, giving a talk about his work and the connections between some of the pieces on display at the Mead. See art, learn, and generally become a better and more well-rounded human being! Hang out and listen to delightful poems! First there’s going to be a musical performance by Conor Ritchie-Dunham, then there’s going to be some open mic poetry! It might feature you! We recommend that you pick a real crowd-pleaser of a poem and see if you can manage to surf. After the open mic there will be featured readings from Victoria Luizzi and Sasha Burshteyn! Honor the creative talents of young local illustrators at the art show with local author and illustrator Anna Alter! Contest participants and their grown-ups will browse a gallery of submitted artwork that highlights what the artists think is special and important about their community. Enter a raffle to win a free school visit from Anna Alter! Are you a pencil-pusher but in the sense of pushing the pencil in elaborate patterns which create beautiful images? Are you an INKredible inker, or do you want to become one? Hang out, sharpen your skills, meet new friends! You’ll need to buy a $5 day pass, but it immediately becomes store credit! Star Trek posits a beautiful future free of conflict and want and also full of ridiculously well-armed “science vessels” that constantly poke about dangerous and politically volatile areas to “study” what effect dozens of Proton Torpedoes have upon the hull of enemy vessels. Play a fun game about those conflicts! Local author Tommy Shea will head to the Odyssey to talk about the biggest hits in basebal! Whether it’s the time that Hank Aaron hit a ball so hard that it knocked a satellite out of orbit or the time that Joe Carter hit a baseball that traveled all the way around the world and wound up scoring him a triple during the next inning. Local writer John Elder Robison is a nationally recognized advocate for the Asperger’s and Autism communities. He was asked to join a study lead by Dr. Alvaro Pascual Leone in the use of Transcranial Magnetic Stimulation to examine the Autism. This book is the story of what happened afterward. Robison will be on hand to read, answer questions, and sign! Everybody’s Fool, a sequel to Nobody’s Fool, and presumably a prequel to Some People’s Fool, takes readers back to North Bath, NY. It’s a small town with some hard luck and the fickle whims of fate! Russo will be on hand for a reading and signing! It’s a free event, but you will need to reserve a spot via rsvp@odysseybks.com! Comic Con at the library! Come to celebrate Free Comic Book day, and wear your favorite cosplay! Free Comic Book Day! The most spectacular day of the year, true believers! ‘Nuff Said! Wait no that was a bit where we used Stan Lee’s style we need to say more: you can get free comics at Modern Myths on this day, it’ll be great! Free Comic Book Day! The most fantastic day of the year, true believers! Excelsior! You can get free comics at Comics N’ More on this day, it’ll be great! Hang out with the sort of people who want to wind down from a hard day of working on a computer to talk about working on a computer! It’s a good chance to meet new folks in the field, learn new things, or just relax with people whose gripes will line up with your own! Meetup organizer Mark D. Hamill will take attendees “under the hood” of WordPress, the lightweight CMS that this website is built with! This is designed with relative newcomers in mind, designed to let you know as much as you need to about what to expect from WordPress and figure out whether or not it’ll meet your needs. Check out the Meetup group to RSVP! The author of Lessons from Sarajevo: A War Stories Primer, and editor of the Massachusetts Review will examine how war has been perceived, described, and interpreted in a variety of genres from photography to poetry to graphic novels and performance art. It’s free and open to the public! Get it? Get it? There’s a whole day of Star Wars related events at Jones! Crafts, trivia, video games, costumed librarians, lots of fun stuff. Also, secretly, they’ll be testing for Force sensitivity. That’s right folks you heard it here first Star Wars is real! Young adults on the Asperger’s/Autism spectrum and folks with family or friends on the spectrum are invited to a support group meeting in the Bak Study Room of Forbes. Introduce yourself, share common experiences, and participate in Big Bang Theory trivia! Pat Leuchtman will show you photos and impart upon you some know-how about how to create a wonderful new garden this spring! Gardening is an excellent way to get a close-up view of some majestic deer as they just rip all your hard work to tiny shreds and then trample the remains. Trivia at Jones! Hang out with a team of up to 5, and try to answer questions about things. Questions specifically designed to make you think oooooh you know that one but then argh you can’t quite remember exactly… wait! Yes! Awesome! A suggested donation of $5 would be appreciated! The new movie! It was pretty good! Wow, it’s already out for home viewing? Neat! Anyway, see it on a moderately-big screen at the library and re-experience the magic you experienced several months ago! A showing of District 9 will be followed by some discussion and… other group and personal process modalities. We’re guessing they didn’t intend for that to sound as sinister as it definitely does sound. You’ve played the rest, now play the best! Or, you’ve not played the best, now play an interesting RPG! Indie RPG Night is your chance to break out of the standard-issue RPG mold and try something new, something unique, and often something local! It’s a great chance to expand your horizons! The Mind’s Eye Society is a licensed World of Darkness LARP. Costumes are encouraged, but not required. No weapons! Conflicts are resolved via card pulls. They do ask that people pitch in a few bucks for the room usage fee! This game is about climate change and possible fae doings, and it sounds like it will be a hoot and a half! Genealogy! The study of the mysterious circle of stones from which you emerged fully-formed one misty night naught be a year ago. It weren’t an opening, not really. It was just open, somehow. The ground, the air. It was open in a way that it wasn’t anywhere else and never will be again. Study the runes, examine the shapes. Discover what you can before the time comes that whatever you fled comes knocking. Resurrection is real! It happens! Not to us, of course. Fortunately or unfortunately depending upon the story. But many animals, plants, and viruses, are able to preserve themselves when conditions are poor, emerging from seeming death when the stars are right again! Dr. Priya Roy Chowdhury will explain the hows and whys for you in this entertaining talk! Dorothy Wrinch presents an interesting view of the scientific community. She was instrumental in the “Protein War”, figuring out how and why Protein react to certain stimuli. She battled sexism, just plain jerkery, and the raw fact of academia. Ultimately, her model was wrong. Marjorie Senechal, Professor Emerita in Mathematics at Smith and editor-in-chief of the best named Journal we’ve encountered recently The Mathematical Intelligencer will explore why exactly Wrinch was willing to fight for a flawed model to the bitter end.